Lt. Gov. Dan Patrick's grassroots advisers are blasting Gov. Greg Abbott's plan to enhance pre-kindergarten programs, a move sure to increase tension between the top two Republican leaders. In a letter dated Tuesday, the lieutenant governor's Grassroots Advisory Board, filled with Tea Party activists and appointed by Patrick, called House Bill 4 and Senate Bill 801 "a threat to parental rights." The bills are aimed at improving the quality of the state's pre-K programs at a cost of about $130 million over the next two years. "We are experimenting at great cost to taxpayers with a program that removes our young people from homes and half-day religious preschools and mothers' day out programs to a Godless environment with only evidence showing absolutely NO LONG TERM BENEFITS beyond the 1st grade," the letter said. Patrick said in an emailed statement that he had not seen the letter before it was sent and noted that he supported "a pre-K program," without giving any details about what that might look like. "The letter in question was unsolicited and expresses the individual viewpoints of Texas citizens. We had no advance notice of the letter and saw it for the first time after it had been distributed," Patrick said. "I look forward to working with the senators, the House and the governor in the coming weeks to create a comprehensive package that includes A-F, parent trigger, opportunity districts, online learning, school choice and a pre-K program that's good for Texas. Together, these bills will have a positive impact on education in Texas." Abbott spokeswoman Amelia Chasse defended the pre-K legislation as wise and cost-effective. "Governor Abbott’s pre-K initiative is a conservative antidote to ineffective pre-existing pre-K programs because it adds accountability, implements high-quality education standards, gives parents and teachers the freedom to determine how best to educate their students and helps schools avoid a one-size-fits-all approach," she said in an email. "It will ensure tax dollars are used more effectively and reduce the $1.7 billion in tax dollars spent on remediation education programs." Sen. Judith Zaffirini, D-Laredo, author of the bill in the Senate, said she was "surprised and disappointed" to see the letter from Patrick's advisers. "It seems rather strange that they would take a stand like that against a bill that is the priority of the governor," she added. Abbott has fought vociferously for his pre-K plan, which has already passed the House. It would give about $130 million, or some $1,500 per eligible student, in additional funding to school districts that adopt certain curriculum and teacher quality standards in their pre-K programs, as well as a "parent engagement plan." 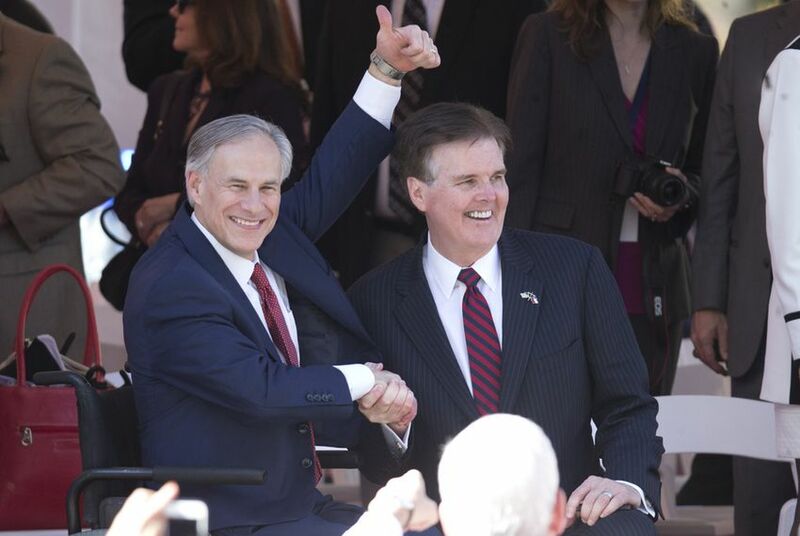 The letter underscores the potential for trouble in the relationship between Abbott and Patrick, who are far different stylistically and could be on a collision course over both education and taxes. After Abbott moved away last week from his earlier vow to "insist" on property tax reduction — considered Patrick's top priority in the Senate — Patrick ignored the shift and invoked Abbott's name as if the governor had chosen his plan over a competing one in the House. In a statement, Patrick also said he would "not support any budget that does not have property tax relief." Both chambers must pass a budget before the new fiscal year begins in September. Without a budget in hand before the regular session ends June 1, the Legislature will have to pass one in a potentially high-stakes special session this summer. While the latest flare-up didn't come directly from Patrick, it suggests that pre-K could be a new front in a power struggle pitting moderate and conservative Republicans against each other — with Abbott caught in the middle. Patrick's advisory board appears to be beyond convincing when it comes to pre-K programs. The Tea Party-infused group, put together at the beginning of the session to advise Patrick on major policy initiatives, said that if the $130 million program becomes law, "Texas would be sending the message to the rest of the nation that parents do not or cannot love and care for their children as well as the state can." It also associated the pre-K program, which has already passed the Texas House with overwhelming support, with socialism. "This interference by the state tramples upon our parental rights," the letter said. "The early removal of children from parents' care is historically promoted in socialistic countries, not free societies which respect parental rights."